What is an asymmetric distribution? An asymmetric distribution is also known as a non-normal distribution or non – symmetric distribution. An asymmetric distribution is an uneven (or imbalanced) data distribution around a central point. It is a probability distribution or frequency of data that is not symmetrical about the central value. An asymmetric distribution is one that is skewed to the right or the left. The distribution data is placed in a histogram, but instead of a bell-curve shape with the majority of the data points in the middle of the distribution, the asymmetric distribution has more data on the left, right, or both. For example, an asymmetrical distribution may have larger values in the tails from larger values than a symmetrical distribution whose larger values are stacked in the middle. Symmetrical distributions are said to be balanced (to have symmetry). A symmetrical distribution has symmetry; it’s called a “normal distribution” and its pattern is recognized as the Gaussian bell curve. Asymmetric data is imbalanced since the data is weighted more on one side or another; it has larger values on the left or the right or both rather than just in the middle. Risk and return profiles are often plotted in a histogram like a bell curve for analysis of the data. Market returns do not fall into a symmetrical distribution. Market returns do not present the perfect balance of symmetry that is assumed by most academic theories considered as modern finance. Stock market returns are asymmetric: they do not fall into a Gaussian normal distribution. Instead, the asymmetry of market returns are skewed because they have “fat tails”. Market return profiles show losses that are much, much, too large and they occur too often to fit into the balanced symmetry of a normal distribution. Since many asset allocators using asset allocation methods like Modern Portfolio Theory that incorrectly assumes symmetry in market returns, these investors are shocked by larger than expected losses and they may get euphoric after larger than usual gains. 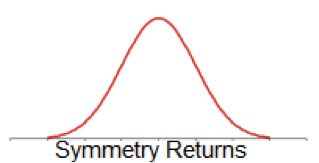 Asymmetric return distributions can show asymmetry on both sides; both gains and losses. The problem is that a very large gain often leads these investors to complacency and over optimism right when they need to do the opposite to have any chance of avoiding a devastating loss. Of course, these type of investors usually don’t believe timing is important, so their beliefs lead to their full participation of the roller coaster swings that occur across full market cycles of bull and bear markets. They are excited after a 100% gain, but downside losses are also asymmetric: it takes only a -50% decline to wipe out a 100% gain and a -50% loss requires 100% just to break even. Some investment advisors state their objective is symmetry. That is, their objective is a balance between risk and reward, profit and loss through their “asset allocation” process. Of course, when you balance profit and loss you make no progress. The result of symmetry is over time is no investment return. Empirical evidence of the performance of symmetry focused investors is they may have periods of gain followed by periods of loss and then another period of gain. Symmetry focused investors have an objective of balance and broad diversification, which says nothing about a positive return. To achieve a positive return, we must imbalance profits and loss; less of the downside losses, more of the profits we want. For profits to exceed losses, we must focus on Asymmetry™: the positive imbalance of profit>loss. Asymmetry cannot be achieved through passive investing or relative return objectives since market returns are non – symmetrical. Kurtosis characterizes the relative peakedness or flatness of a distribution compared with the normal distribution. Positive kurtosis indicates relatively peaked distribution. Negative kurtosis indicates relatively flat distribution. Kurtosis measures the “fatness” of the tails of a distribution. Normally, the far left or right ends of a distribution are more narrow than the middle. 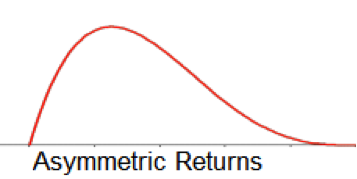 When a return distribution is non-normal, it’s tails on the ends include higher negative or positive returns. Positive excess kurtosis means that distribution has fatter tails than a normal distribution. Fat tails means there is a higher than normal probability of large positive and negative returns. Skewness characterizes the degree of asymmetry of a distribution of returns around its mean. Positive skewness indicates a distribution with an asymmetric tail extending toward more positive values. Negative skewness indicates a distribution with an asymmetric tail extending toward more negative values. These findings prove that risk estimates based on the normal distribution, even with volatility clustering, systematically misrepresent the true nature of the risk being taken. More sophisticated modelling techniques are necessary in order to capture widely observed phenomena such as risk asymmetry and fat tails.